And a very happy New Year to all. So what did Santa bring you? Apart from the cold I got a 4-day migraine and – a nice Dickensian touch, this – a notice by our landlords to vacate the flat by March (but the joke’s on them, given that we’re hoping to move out before then anyway). Still, I also got a centenary box set of all Mahler’s symphonies (well, you can never have too many, can you?) and a season of the fabulous old black-and-white tv series The Avengers with Diana Rigg on DVD (“Mrs Peel, we’re needed”). So that’s my 2012 sorted. What with all this sitting around and listening to Mahler and all, I’ve got rather a lot of knitting done. All of the back yoke, in fact, and two-thirds of the front. 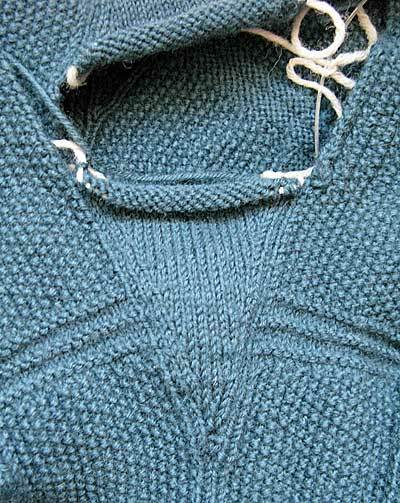 I’ve kept the armhole length short this time – 8.5 inches including 1 inch of rig ‘n’ fur shoulder strap – on the grounds that the moss stitch will open up and stretch a bit once it’s blocked (I’m learning!). You will also see from the photographs that, now I’m home, I’ve gained access to my stash of spare yarn from previous ganseys, so I can finally put the gusset stitches on proper holders! In other gansey news, many thanks to Lynne for pointing out a really interesting Radio 4 programme on the ganseys of the Moray Firth in Scotland. You can listen to it at Open Country – the BBC usually has its programmes online to listen again for 7 days, so this should be available till Thursday. It was of more interest to me than it would otherwise have been, too, since the presenter talked to knitters in Helmsdale and Dunbeath, communities not so very far from Wick. I now have some useful contacts for my own research! 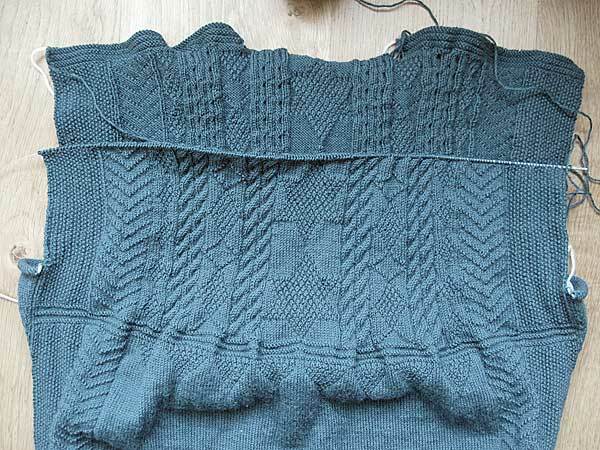 Also, if you haven’t already come across it, Wendy Johnson recently knit a Filey pattern in Rowan yarn – you can see pictures on her blog from last November – or click on the link in her “completed work” section and sign in with a Ravelry account to see more details. Which just shows how effective gansey patterns are however they’re used. Finally, a special hello to Song, poster of this parish, who took time while she was over in the UK to come up to Edinburgh and pay us a visit. It’s always good to meet people after corresponding through the blog – so that makes two now, along with Judit (hello Judit!). Like the old joke about what do you call a thousand lawyers at the bottom of the sea, it is, I feel, a good start. Your marvelous notes have just got me through the neck and shoulder straps of my gansey ( epic gansey). Thanks so much – love the rig and fur! 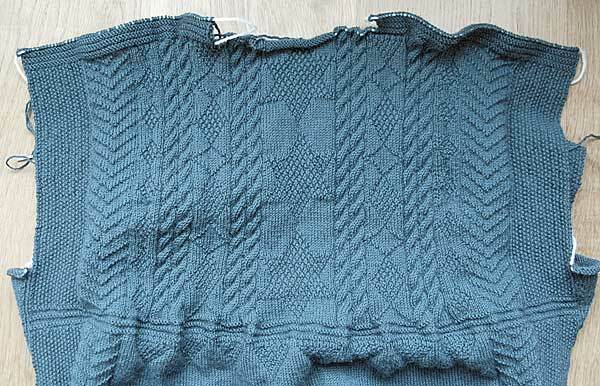 The gansey yoke looks stunning and I think those ‘hanging triangles’ are going to be very effective once the blocking is done. Thanks for sharing the fireworks display – I kept thinking I would hear Mahler in the background, but I think I did hear the clicking of knitting needles! The chevrons running up the sides are a nice touch. I’m also more than a little partial to stars… Great to see all the progress over the hols. The radio piece was great too – ’til my bandwidth ran out! Hopefully I can catch the rest later… Happy New Year to both you and Margaret. Unusually for me, this year I saw in the New Year while knitting at a casual get-together with friends. Thanks for the shout out! 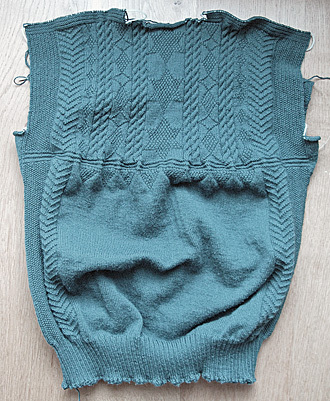 I’ll be embarking on another gansey-type knit in the next couple of days, as soon as I finish Alice Starmore’s “Cromarty” which is almost complete. It is looking great! I tried to get the Open Country broadcast but could not open it – it probably isnt accessible from the USA. Santa brought me a longer set of double pointed needles and some circular needles so I am running out of excuses not to start my own gansey! I have the cones of Frangipani yarn I brought back from GanseyFest prominently displayed. Alison – I was able to get the broadcast in Western Canada. I Googled “radio broadcast UK ganseys” and found the BBC site first on the list. Try again, it’s worth it. The Open Country broadcast was great – got it fine on Cape Cod. Thanks Gail and Lynne! I will keep trying, I was trying to access the broadcast via my iPhone, I will try the computer next and see if I can get that to work. Good Morning Gordon ! Many thanks for the new years greeting and congratulations to the gansey you are knitting just now ! So I ask for wishes of good luck as I attempt my first Gansey. I have decided to work up the Whitby pattern as the history is really wonderful. Many thankyous to Gordon for this amazing website, without which I would never be able to attempt this! Hi all, and thanks for the comments. Back in Wick after driving the 256 miles from Edinburgh in horrid weather – sleet and snow, and gale force winds (102 mph recorded in Edinburgh recently – and to think I went south to escape the wind!). Not sure that a house with no heating for 10 days and sub-zero temperatures outside is the best remedy for a rotten cold, either! Thank God for hot-water bottles and whisky. Linda, Many congratulations on venturing on your first gansey. I always find the moment when you unwrap the wool and get that “new car” smell is lovely – like a fresh spring morning, it’s full of possibilities. Please keep us posted on your progress, and remember, if you have any queries at any stage, I or anyone else on here, will be only too pleased to help if we can! HI! I had a great time visiting you and your lovely wife (and all those lovely knitted things. I didn’t steal any – aren’t I good?). We were worried about you and the storm winds, but … well, you’re sturdier than you claim, so I wasn’t too worried. You wretch. Next to my Strapping Geordie Lad, you’re but a slender weed. And anyway, I’ve seen the stairs you have to climb to get to your eyrie. I can’t imagine having to haul all my shopping up those stairs! I also have started a gansey, although a pseudo-gansey. Got a great deal (do you see trouble looming…?) in Howard County at the Maryland Sheep and Wool Festival in May but they only had two cones of this wonderful naturally brown wool. So, it may have to be a vest, but I have started on my #2 needles using Gordon’s marvellous instruction (including swatch knitting) and some of his patterns from past projects, Flamborough and Fife. I started Jan 1 and am now 8″ into it. I wish I could say it is a great project during the snow and ice of winter, but this darn climate change had me bike riding Dec. 20, ice on Buzzards Bay (salt water) the other day, ocean-effect snow this morning, and we are in a warming trend. Most unsettling and not what anyone could call winter. Mother Nature may just reach out and grab us yet exacting payment for my heresy. I have been knitting mittens most of the winter (maybe that is why we aren’t getting any winter? it is 46 degrees F/7.7 this afternoon which is record territory for Minnesota in January). I feel I need a change. Those two cones of Frangipani yarn and Elizabeth Lovick’s CD are haunting me. I think I should make a start on a gansey. After swatching, I was wondering if there is any good reason why I should not start with a sleeve (which would be much easier to take around with me)? As far as I’m concerned, anyone can do anything! There are no gansey police to make a citizen’s arrest and ensure that the regulations are being obeyed. As Lynne says, the traditional method is to start at the bottom and work it seamlessly, as a tube, with the sleeves picked up organically from the body. (This is its main attraction for me – no sewing! Huzzah!) Speaking as a non-sewer (that’s someone who doesn’t sew, not somebody who isn’t a channel for effluent, you understand) I don’t know how you’d incorporate the gussets if you knit the sleeves first, but that could be just ignorance on my part. Anyway, however you decide to go, please let us know how you get on! My new gansey is ready and I wonder how can I show it to you and to the ganseyfolk here ? A Belated Happy New Year to everybody! Back home and trying to get into the usual routine again but have still to take up the knitting again. Belatedly discovering that a 3 day family houseparty not only takes up a lot of time in preparation but a lot of time sorting everything out once you get home again! Posting off the various pieces of ‘left behind’ property to their rightful owners, making sure that 4 ‘not-quite identical’ slow cookers are all reunited with the right outer, inner, lid and owner, getting 12 dozen glasses washed, sorted and returned to the wine merchant, washing 12 damask linen tableclothes etc has taken the best part of a week. But oh the joy of getting it all done and being able to look forward to picking up the knitting again in front of the log fire! Hello Judit! Congratulations – email me any pictures at gordonr@ganseys.com and we’ll get them onto the Reader’s Gallery, and I’ll flag them up next week. Hi Sue, and happy new year. Your festivities sound like fun, if a bit overwhelming. You could always just auction the left-behind stuff on eBay… No? Well, it was just a suggestion. Knitting in front of a log fire paints an idyllic picture – somehow an electric storage heater isn’t quite the same!